In honor of me turning 30, I made mix CDs of my favorite songs from each of my 30 favorite musical artists/groups. Read the introductory post for more background information on my 30 at 30 project. Reminder: there is no scientific rationale for this list. They’re simply my personal favorites. 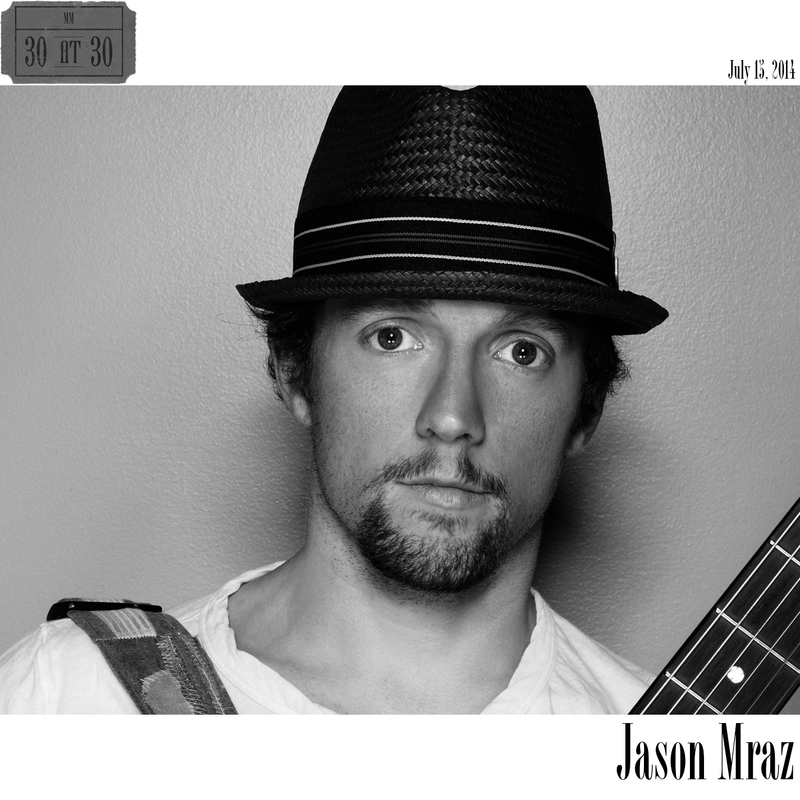 Coming in at number 9 is Jason Mraz. “Yeah the Mr. A to Z, they say I’m all about the wordplay,” Mraz sings on the song “Wordplay,” a self-aware song of saccharine pop music in which Mraz explains the twists and turns of his lyrical acrobatics. Although that song didn’t make the cut for my ultimate compilation, Mraz’s lyrics have left an indelible imprint on my life. Over the past decade or so, Mraz has combined cocky, clever wordplay with introspection and sentimentality in his songs. His ability to vacillate between ice cool confidence and heart-on-his-sleeve vulnerability—plus his ability to turn a phrase—is what makes Mraz a top-10 favorite of mine. After one listen through his 2002 album, Waiting For My Rocket to Come, I was on board the Mraz bandwagon. Songs like “Curbside Prophet” demonstrated a hip hop influence in terms of the way he put words together, but Mraz would never be confused for Eminem. He’s not a rapper, and unlike Eminem, the man can sing, too. Plus, in place of thumping bass beats, Mraz’s music included everything from acoustic guitars to a brass section to banjo. And for every happy-go-lucky track like “The Remedy (I Won’t Worry)” Mraz also had something like “You and I Both”, a tender-hearted love song. Over time, Mraz’s softer side would prove to be his most commercially successful avenue, but it’s his combination of moods that kept him in my rotation. The rest, as we say, is relationship history, but we owe a special debt of gratitude to Mr. Mraz for the instrumental (or should I say lyrical?) role he played in kickstarting our relationship. And, aside from the personal love story connection, the songs are quite lovable on their own merit. Later that year, 2005, Mraz would release his second major album, Mr. A-Z. While some of the album felt a bit overproduced, especially in light of the acoustic sets Jessie had introduced me too, there were a few standout tracks. “Clockwatching” is a smooth-talking track that again put Mraz’s lyrical dexterity on display. The words really hit home for two young people in love fighting the uphill battle against parent-imposed curfews. “The Forecast” boasts that “crazy is the forecast all week.” In my experience, that is a fair enough summation of trying to maintain a long distance relationship in college. At 8:10 “Song For a Friend” is the longest Mraz to make the cut. Just when it seems like the song is over, the drums bring in a fantastic gospel-style chorus that is goosebump-inducing. In 2010, when Jessie and I got engaged, I proposed at sunrise, and of course I had a playlist to accompany the event. Mraz’s “Conversations With Myself” from the aforementioned acoustic mix Jessie had introduced to me some five years earlier was the second song I played that day. I just of easily could have included the appropriately named “Sunshing Song” from Mraz’s 2009 release Jason Mraz’s Beautiful Mess – Live On Earth or “Hey Love” from his early career live and acoustic release. Only one song made my compilaion from Mraz’s 2012 release Love is a Four Letter Word, but “I Won’t Give Up” is a gem with a lyrical maturity that mirrors the mature, married love I share with Jessie. Unfortunately Mraz’s latest album, 2014’s was released so close to the date of making this compilation that it did not land any tracks. However, since I’m writing this several months later, I have to mention that Mraz’s music is still going strong as several of these songs have already landed on recent Matt’s Mixes. Clearly Jason Mraz and his trademark Jason Mraz hats aren’t going anywhere anytime soon.